Have you ever wondered who actually constructs the massive contemporary artworks we see around us in parks, public spaces and art centres? Sculptures as tall as trees, massive shapes clinging to the side of houses? Artists conceive them and do detailed designs but in fact very few have the facilities to actually construct their creations. That’s where companies like CHD Art Production, in Montpellier, come in. They construct massive modern art pieces designed by artists worldwide, in a variety of materials including concrete, wood, metal, fabric, and composites. Using a range of skills and disciplines (sculpture, casting, printing, laminating, assemblage and of course painting) they work with the artist to produce permanent and temporary pieces which can be installed anywhere in the world. “We are always learning new things, it’s always fun and interesting, and we often tackle huge challenges,” says Pauline Margier of CHD. “Gue(ho)st House was the company’s first monumental work and it’s very satisfying for the team to see the finished result. Everyone contributed, the engineers, technicians, fabricators, and the artist of course and at every level everyone was satisfied. They construct pieces commissioned for exhibitions, events, public spaces, and architectural projects - often humorous and funky, sometimes serious and challenging but increasingly, outsized. You can spot pieces all over France (but particularly in Paris, Montpellier, and Nîmes) as well as in Rome, Moscow, Copenhagen, Venice and Berlin. Gue(ho)st House designed by Christophe Berdaguer and Marie Péjus is in Delme (57). The ‘ghostly’ polystyrene and polyurethane shell (made by CHD Art Production) was mounted on a steel framework and placed over an existing house in the grounds of the Delme Synagogue Contemporary Art Centre, inside a 19th century synagogue. The building has a mottled history as a prison house, a school and a funeral home but in its new incarnation is used as a reception space for visitors and offers studio space to resident artists. The name of the project, which was conceived to mark the centre’s 20th anniversary, derives from Marcel Duchamp’s wordplay: “a guest + a host = a ghost” and the two artists say that the ghost is a metaphor, reflecting the interface between the centre as a host and its visitors as guests. The idea of the covering oozing out across the grass is meant to show the building as a living body moving between the past and the future. 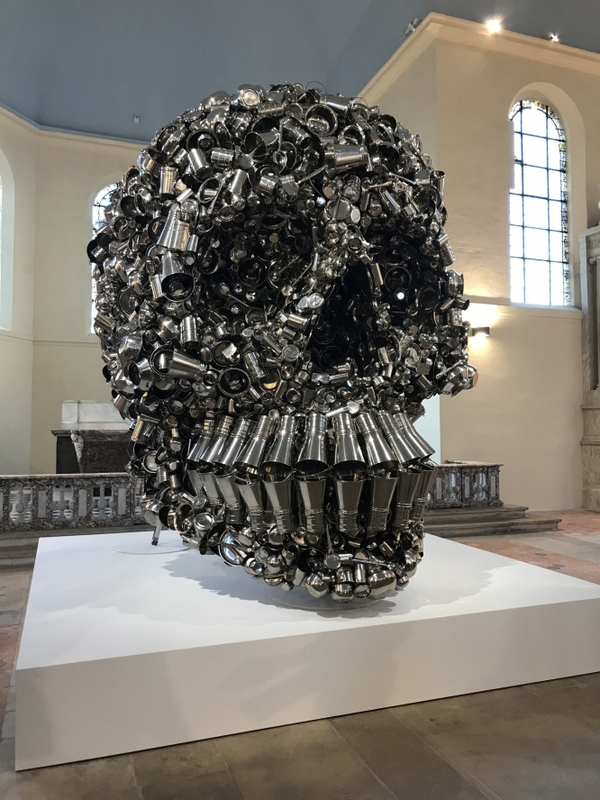 Another artwork which they brought to life is Very Hungry God (2007) by the Indian artist Subodh Gupta. CHD Art Production mounted the stainless steel sculpture and install it in the various locations where it is exhibited. No mean task, seeing as it weighs nearly a ton. Constructed from reused pots, pans and tiffin boxes, it is a meditation on the interplay of cooking, life and death. It has been exhibited in Venice and Paris as well as Chicago. L’autre Mer (2016) by Jean Denant can be seen in Marseillan, where it is fixed to the side of the Château du Port. 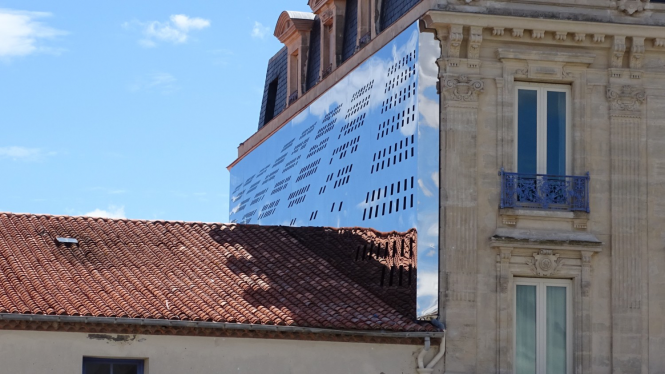 CHD Art Production constructed the stainless steel sheets and attached them to the building, where they face the Etang de Thau reflecting the dancing light of the water, and the nearby sea. The slots represent the oyster beds, which are such a feature of the area.